Faena is an herbicide produced by Monsanto. The word means work in Spanish, and where I was living, a "faena" was also a volunteer work party. So, a group of campesinos might organize a faena to clean one another's fields of weeds. In my conversations with campesinos, there seemed to be some discord among neighbors created by the use of herbicides to clear fields, a labor normally done by machete. Western development can often have unintended consequences. For example, some women I spoke with complained that the use of chemicals had changed the men in their community. 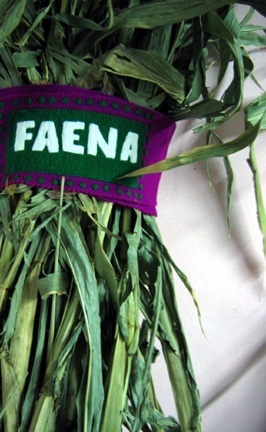 The tradition of a faena is replaced by chemicals like FAENA. Men no longer want to work their fields and the community tradition is lost. Self-reliance is replaced by market dependence.